You know, last night is in desperate need of a great nickname. Every great sporting event has a nickname. I posted on my Facebook account last night that it was the best night of baseball in the history of the game. I wondered if I was exaggerating, I didn’t feel like it. My gut told me that I would never see anything like it again. I was immensely gratified this morning to hear experts like Buster Olney and Jason Stark say the same thing. It didn’t start out that way. David Price was terrible early, and I do mean terrible. Price can be a very frustrating pitcher sometimes. He is so amazingly talented, but sometimes it seems like all he wants to do is throw fastballs. Sure, he has a great fastball but you just can’t pump fastball after fastball in to major league hitters. That’s what he did last night. It’s not the first time, but it was definitely the wrong time. When the Rays got down so far so fast it was absolute heart wrenching. I knew that we were going to lose at that point. Then it was just matter of whether or not the Orioles could save our season by beating the Red Sox. I have a confession to make. I didn’t watch the whole game. Around the 2nd inning my wife starting asking trivial pursuit questions to get our minds off of what we were seeing. By the 4th inning it was too much. We flipped the game off in favor of a tivo’d copy of The Great Food Truck Race. That show ended around the bottom of the 7th and I headed back to the computer room to edit an upcoming article that I’m working on. I didn’t even have the game on at first. Then I thought about how this might be my last chance to listen to Dwayne Staats this year. I really miss his voice during the offseason so I flipped it back on just to have it in the background. That’s when the magic started. All of a sudden we were getting on base. Guys were walking; guys were getting hit by pitches. All of a sudden we had a run. Then Sean Rodriguez got hit by a pitch right in his gut and we had another run. At this point the bases are loaded with 1 out and we’re down 7 to 2. I’m still not getting excited. I don’t want to get myself worked up just to have my heart broken again. Still… anything can happen right? So I finish up my edits while BJ Upton hits a sac fly and walk into the bedroom to watch the rest of the game with Edith. I’m thinking to myself, you know, if Evan can get a hold of one here then we might have a shot at this game after all. Right then he ripped the next pitch into DEEP left-center field. Now we’re down 7-6. Thank goodness. Now, at the very least, we didn’t go down like a bunch of punks who didn’t deserve to be there. Plus the Sox and Orioles are coming out of their rain delay. If we’re really luck the next Boston pitcher will be either over amped or messed up because of the rain delay and the Orioles will pound him. No such luck. In fact, of the next few innings it’s all the Orioles can do to keep Boston from expanding their lead. Back to the Rays, bottom of the 9th, this is it. This is our last chance. First up was Zobrist, I love Ben, if anybody can get a hold of a fastball and yank it over the wall it will be Ben. No dice. Next up was Casey Kotchman. Kotchman has been great all year, what a huge surprise he has been. Maybe he can slap something into left field and get us started… No. Who’s coming up next? Sam Fuld? Surely Maddon will pinch hit for Fuld. Ok there, Fuld’s going back in the dugout. Wait, is that DAN JOHNSON? Crap. It’s over. Sure, he had his magic moment pinch hitting in 2008 to beat the Sox and help propel us to the division championship. But this isn’t 2008. We tried to make Johnson our first basemen to start the year before Kotchman showed that he had magic in his bat. He was terrible. God Awful. Painfully bad. GO! GO! GO! GONE! I jumped over and hugged my wife. She was yelling “Oh My God!” over and over. We were in shock. It really felt like it was going to be over. There was no way that what we saw just happened. It was easily the biggest HR in club history and one of the biggest in the last 20 years. All of a sudden it was ok to dream again. Anything can happen in extra innings (sponsored by Jack Links Beef Jerky) J. Fast forward a few innings. I was on Facebook talking with friends about how amazing this was. All of a sudden a post popped up. The O’s had tied it! I flipped over to ESPN just on time to see Robert Andino hit a ball to Carl Crawford. DROP IT CC! YES! 4-3! Boston Loses! It was too sweet. Now the pressure was really off. No matter what happened we were going to be ok. We would have one last chance to fight for our spot. I loved the Orioles in that moment. Watching them celebrate was awesome. One of my favorite moments of the night was seeing them in a dog pile with somebodies legs kicking futilely in mid-air. It was amazing. But no time to savor it. I had to crow about it on Facebook and on Twitter. I had to flip back to the Rays game. We could actually finish this thing off tonight! Then Evan hits his low line drive HR over the low fence by the 315 marker. If the world ended in that moment I would have been content. In fact, the world could have exploded all around me and I wouldn’t have noticed. How was this possible? From the lowest of the low to the highest of the high in the span of 5 hours. This is why baseball is great. I love football. I love the energy, the athleticism. I love everything about it. But it’s not baseball. Football is like hundred yard dash compared to a marathon. Both of them require great skill, but the pressure a marathon racer faces when he’s in sight of the finish line after running 26 miles with another runner right beside him is not possible in football. In baseball, anything is possible. 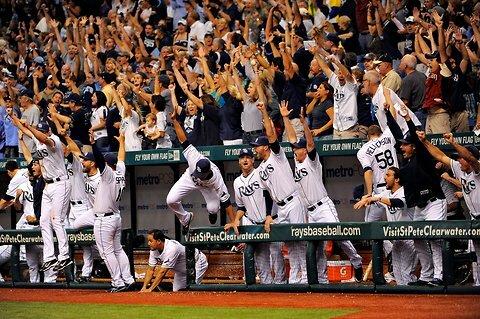 Posted on September 29, 2011, in Sports and tagged American League, Best night of baseball ever, Celebration, DAN JOHNSON, David Price, Evan Longoria, Playoffs, Rays, Red Sox Collapse, Wild Card. Bookmark the permalink. 1 Comment.